In gardening, we learn to take the good with the bad – the weather, insects and weeds. However, seldom do we consider the bad we may do ourselves. Farmers pay special attention to this. Some herbicides they use to kill broadleaf weeds don’t break down for a long time. An herbicide still can be active even after it has passed through the digestive tract of an animal and then composited for months. 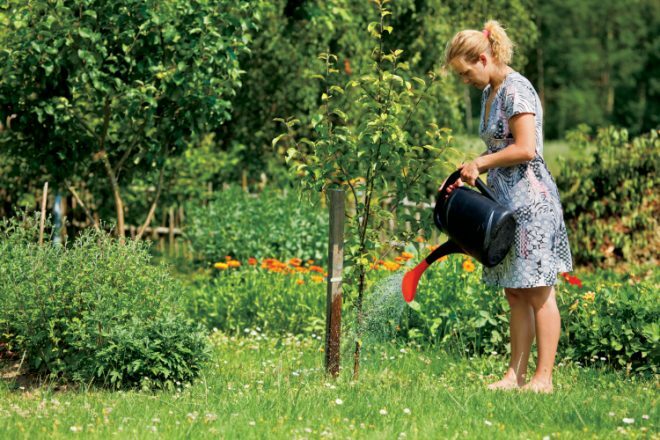 Compost containing herbicides could wipe out your poor garden. Just a few parts per billion in the compost added to your garden will cause the seedlings to die! If this has happened to you, now you know why. Read information on the herbicide label. When plants are young, it’s hard to give them the room or know how much room they will need when full grown. Crowded plants don’t have room to stretch out and air can’t circulate, so leaves stay wet too long and then disease moves in. Give them the space they need. To avoid overcrowding, read information about the plant at maturity and decide from there. If plants come in a six-pack, such as tomatoes, there’s always the temptation to plant all of them, even though you need only two or three. Don’t overplant. Try giving extras away or tossing in a compost pile. You’ve put the right tree in the right place, broken loose the roots and dug the right size hole, thoroughly watered as you planted, and then added mulch. Excellent. But you’re not done. For the rest or the year and even the following year, you need to water and check on the tree. It will take that long for the plant to establish roots and adjust to its new location, and it could take as much as two years. Plants want to grow and thrive. When we treat them with kindness by providing all their requirements, we are rewarded with lovely tomatoes or a great shade tree.